Set on the coastline where the Caribbean Sea meets the Yucatan jungle, a few minutes’ walk from Playa del Carmen, Grand Velas Riviera Maya is a member of the prestigious 'The Leading Hotels of the World' group, which takes guests beyond all inclusive and raises the bar for luxurious hospitality in Mexico. The hotel is divided into three exclusive zones, each reflecting a unique theme: a regenerating Zen Grand Ambiance in the middle of the jungle, a Grand Class Ambiance for romance seekers, and the family friendly Ambassador. Choose from a wide range of fine and gourmet cuisine curated by celebrated chefs from all over the world. From decadent French gastronomy to authentic Italian dishes and Asian fusion, the seven restaurants at Grand Velas Riviera Maya will keep your senses alive throughout your entire stay at the resort. Other facilities and services include an award winning holistic spa, a private white sand beach, a gorgeous infinity pool and 24 hour room service. Situated in the Grand Class zone of the resort, Piaf is a French fine dining restaurant named in honour of Edith Piaf. This elegant diner boasts a beachfront setting and serves exclusive French brasserie style dishes, as well as Riviera Maya specialities. 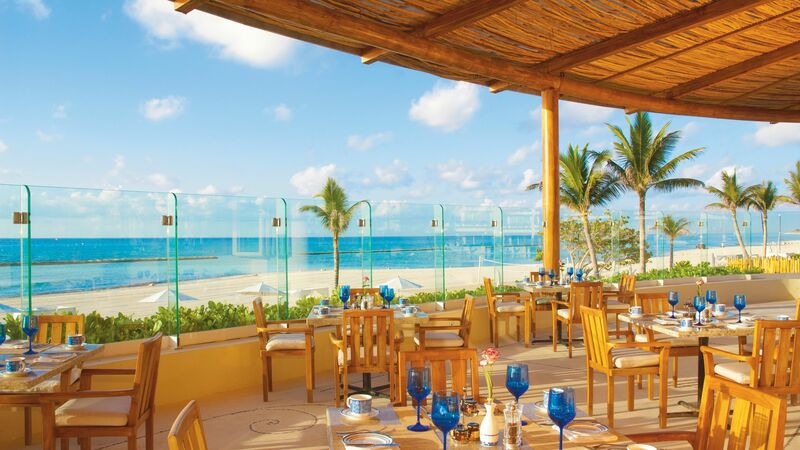 Azul is situated in the Ambassador section of the resort and offers all day dining options with spectacular ocean views. Featuring the best of North Italian cuisine, Lucca’s Chef Aurelio Arista offers guests a selection of seafood, meat and pasta dishes. Offering a unique Mexican culinary experience with a modern twist, Frida is located in the Ambassador section of the resort, and is perfect for families with children. Sen Lin is an Asian fine dining restaurant, where Chef Issac Esparza takes guests on a culinary journey through Thai, Japanese, Chinese and Vietnamese traditions. It is located in the Zen zone. The dress code is Smart Casual. Reservations are required. 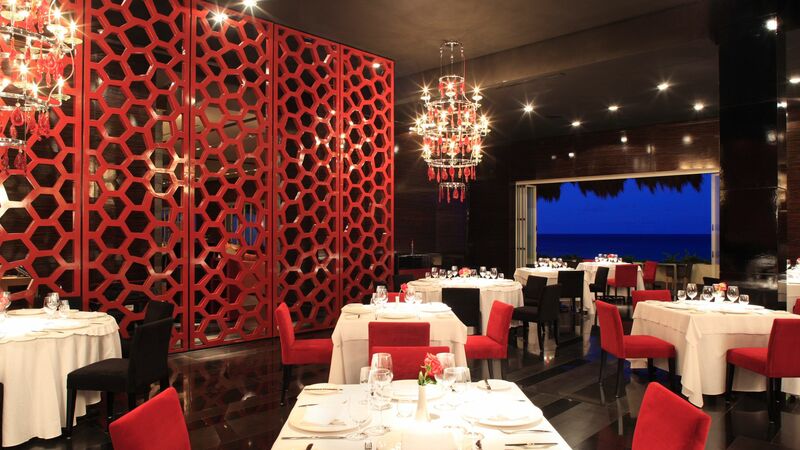 The resort’s signature diner has a menu designed by celebrity Chefs Bruno Oteiza and Mikel Alonso. 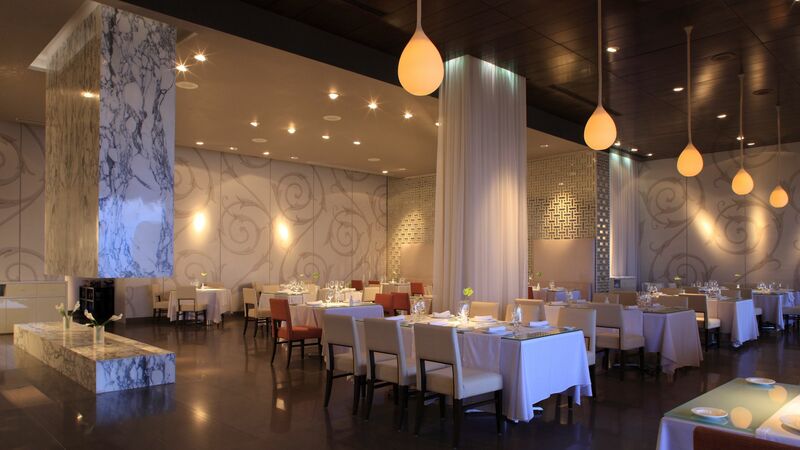 Guests have a choice of two different tasting menus with fine dishes including the basics of molecular cuisine. Chaká is a casual, open-air restaurant situated in the middle of a gorgeous tropical jungle. Its menu boasts a variety of healthy, organic international dishes. 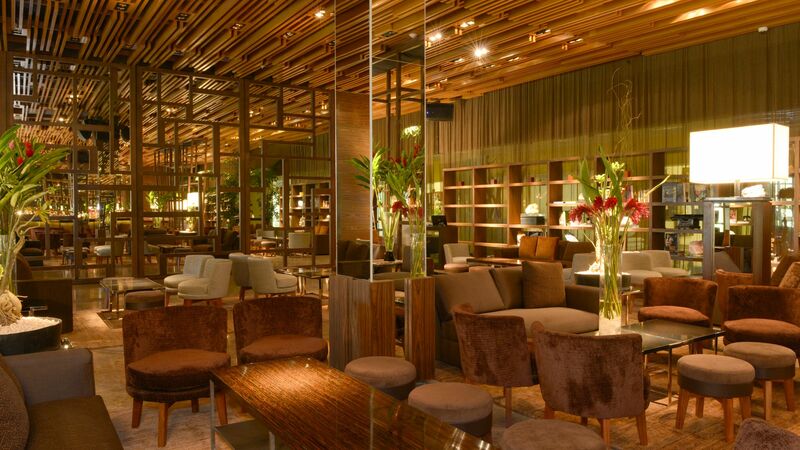 Grand Velas Riviera Maya has eight bars and three snack bars, where guests can enjoy the best cocktails, beer and wine selections in different ambiances and settings. Each of the three zones of the resort has its own expansive freeform infinity pool with plenty of space for sunbathing. All suites also come with a private whirlpool. 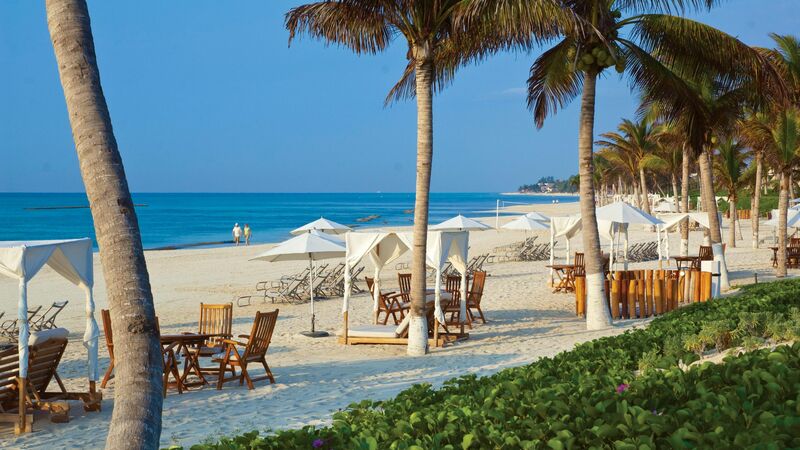 Mexico’s glorious white sands are located right in front of the hotel. Here you’ll find sun loungers, as well as water sports. 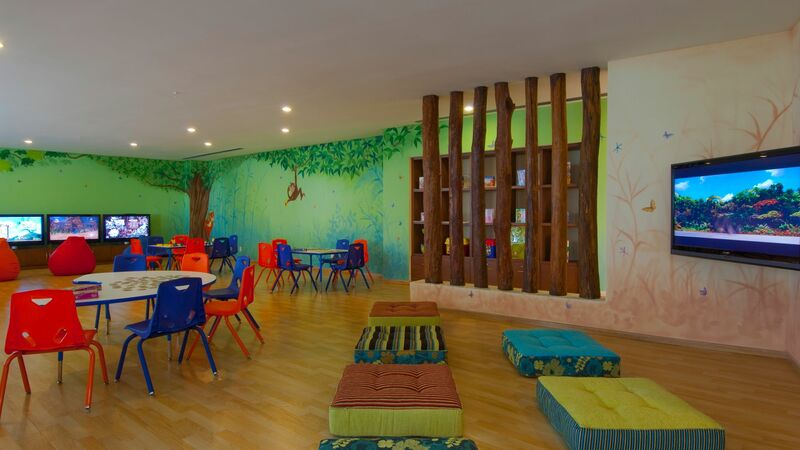 The Grand Velas Kids' Club is open throughout the day, and offers a wide range of activities such as storytelling and board games. 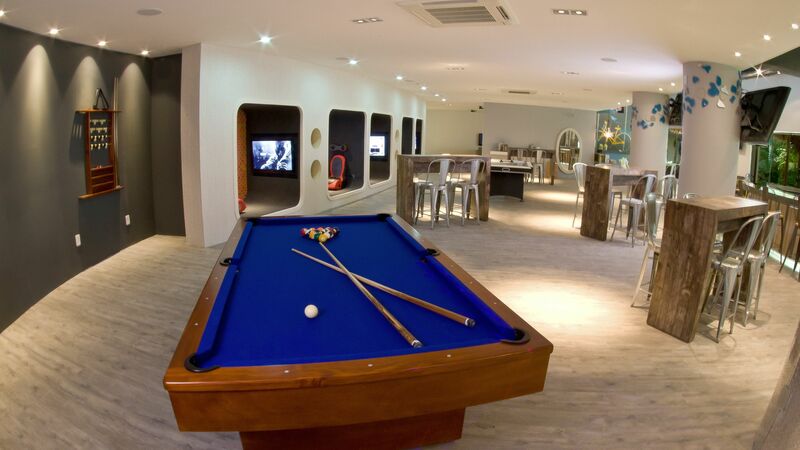 The Teen’s Club features a chill lounge equipped with the latest video games, a karaoke zone, and sound system. Guests travelling with babies can pre-order a range of baby equipment to use during their stay, such as cots, pushchairs, high chairs and bottle sterilizers, through the hotel's Baby Concierge. 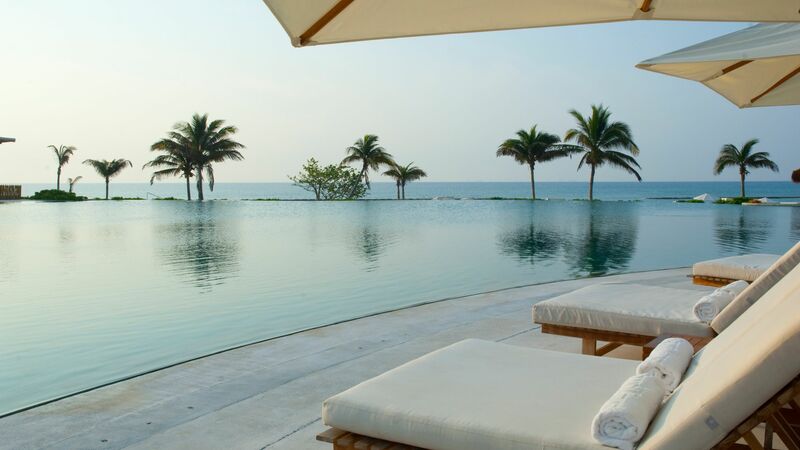 The wonderful Grand Velas Spa is bordered by a jungle, and comprises 40 suites, making it the largest hotel spa in South America. 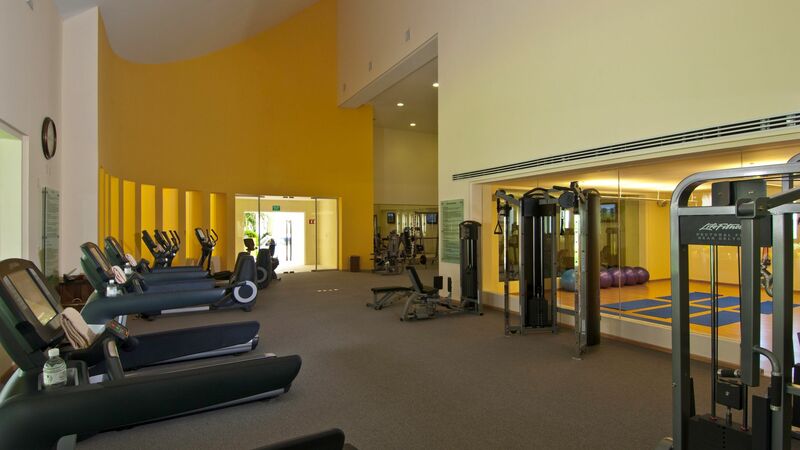 The hotel’s Life Fitness Centre is equipped with state of the art machines, including cross trainers, treadmills and bikes, along with a weight training station. It also offers a variety of fitness classes for the resort’s guests. Guests of Grand Velas Riviera Maya can enjoy a range of activities offered by the resort such as yoga classes and bike tours. Take to the crystal clear waters in front of the hotel with a variety of water sports, including snorkelling and sailing. Scuba diving trips can also be arranged. The Riviera Maya is a famous touristic district south of Cancun, in Mexico. It is well known for the variety of all inclusive luxurious resorts and an ancient tourism base of charming boutique hotels and fine dining outlets. Attractively presented along the famous Fed 307 the hotels and restaurants feature spectacular views over the white sandy beaches of the Caribbean Ocean. The Riviera Maya’s beautiful eco-parks offer a wide range of thrilling day activities such as river tubing, snorkelling, jet skiing, sailing, horse riding and zip lining. For nightlife lovers, Playa del Carmen’s stylish paved boulevards are lined with hundreds of world class bars, restaurants and clubs. 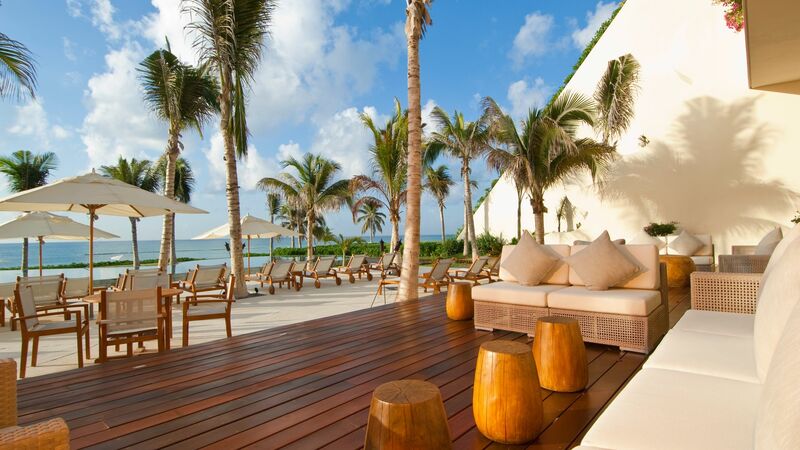 Grand Velas Riviera Maya is a 35 minute drive from Cancun Airport. 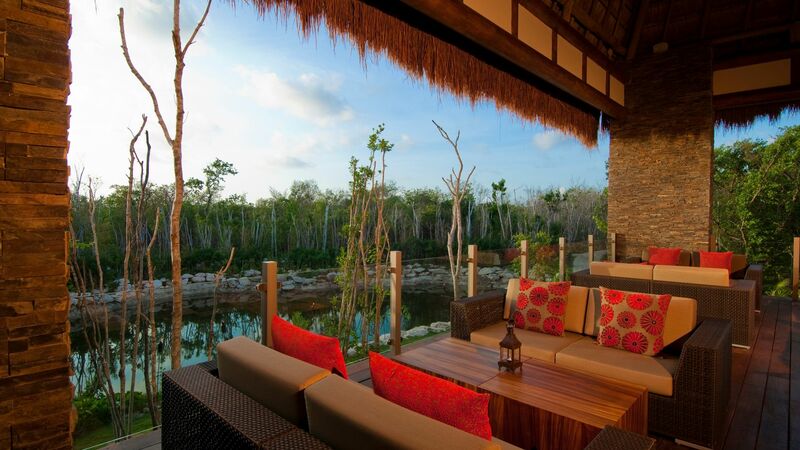 Zen Grand Suites are located in the jungle approximately 1km (2 minutes) from the beach (a shuttle bus is available). They feature 1 king size or 2 queen size beds, air conditioning, cable TV, CD/DVD/MP3 player, telephone, safe, Nespresso coffee machine, minibar, iron & ironing board, seating area with sofa, bathroom with whirlpool bath, rain shower, L'Occitane amenities, hairdryer, bathrobes & slippers and a balcony or terrace overlooking the jungle vegetation. From 19 December 2018 this room type will be known as a Zen Grand Suite Nature View. Zen Grand Pool Suites are located in the jungle approximately 1km (2 minutes) from the beach (a shuttle bus is available). They feature 1 king size or 2 queen size beds, air conditioning, cable TV, CD/DVD/MP3 player, telephone, safe, Nespresso coffee machine, minibar, iron & ironing board, seating area with sofa, bathroom with whirlpool bath, rain shower, L'Occitane amenities, hairdryer, bathrobes & slippers and a terrace overlooking the jungle vegetation.These suites feature a private plunge pool on their terrace. From 19 December 2018 this room type will be known as a Zen Grand Pool Suite Nature View. Ideal for families, the Zen Grand Two Bedroom Family Suite features two interconnecting rooms, one with a king sized bed and the other with two queen sized bed. Both rooms have an en suite bathroom with jacuzzi tub and separate rain shower. Ambassador Suites are located around the main infinity pool. They feature 1 king size or 2 queen size beds, air conditioning, walk-in wardrobe, cable TV, CD/DVD/MP3 player, telephone, safe, coffee machine, minibar, iron & ironing board, seating area with sofa, bathroom with whirlpool bath, rain shower, L'Occitane amenities, hairdryer, bathrobes & slippers and a balcony or terrace with ocean views. From 19 December 2018 this room type will be known as an Ambassador Suite Ocean View. Ambassador Pool Suites feature their own private pools on the terrace. They feature 1 king size or 2 queen size beds, air conditioning, walk-in wardrobe, cable TV, CD/DVD/MP3 player, telephone, safe, coffee machine, minibar, iron & ironing board, seating area with sofa, bathroom with whirlpool bath, rain shower, L'Occitane amenities, hairdryer, bathrobes & slippers and ocean views. From 19 December 2018 this room type will be known as an Ambassador Pool Suite Ocean Front. Grand Class Suites feature 1 king size or 2 queen size beds, air conditioning, walk-in wardrobe, cable TV, CD/DVD/MP3 player, telephone, safe, Nespresso coffee machine, minibar, iron & ironing board, seating area with sofa, in-room massage table, bathroom with whirlpool bath, rain shower, L'Occitane amenities, hairdryer, bathrobes & slippers and a balcony or terrace with a private plunge pool and oceanfront views. Children under 12 years are not allowed in the Grand Class section of the resort. From 19 December 2018 this room type will be known as a Grand Class Suite Ocean Front. Save up to 39% on the hotel price for holidays between 05 January - 13 April 2019 or save up to 35% on the hotel price for holidays between 26 April - 18 December 2019 or save up to 29% on the hotel price for holidays between 14 - 25 April 2019. We just got back from the most amazing week at the Grand Velas. The service from the moment you arrive is outstanding! We loved the food so much! The buffet breakfast at Chaka was great each morning. There is something for everyone and it is delicious. Alberto one of the servers at Chaka remembered what we liked to drink each morning! We loved Frida (my favorite), Piaf, Lucca and Sen Lin. The kids found food they loved at each restaurant. They are very accommodating to even picky eaters. 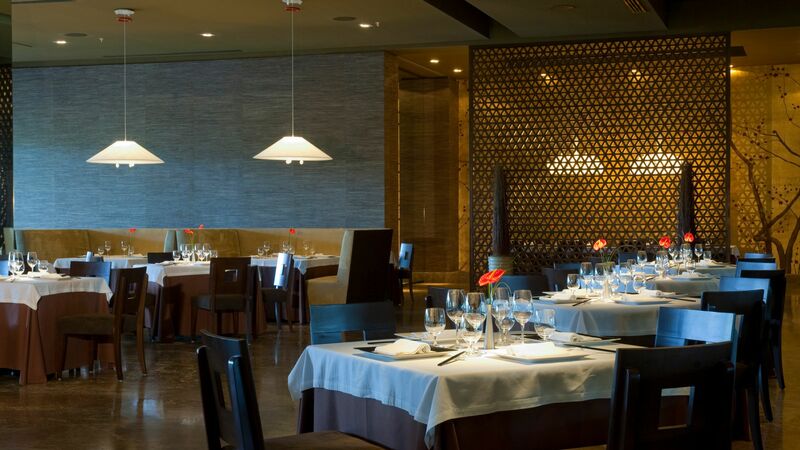 You need to be adventurous eater at Cocina de Autor. My husband really enjoyed that experience. We all loved the pool at the Ambassador. Each day they would set up activities for the kids which was great! Jorge Gonzalez one of the pool concierges was the BEST! We were a group of 19 and he was so attentive to all of us! The drinks and food set up by pool and beach were awesome. Our kids went to the kids club a few nights so the adults could go out! They brought them to eat and then to the nightly show. My only suggestion would be keep the kid clubs to probably age 6. It really is for younger children. Our 7 to 12 year olds loved the teen club! They did not want to leave when we picked them up. 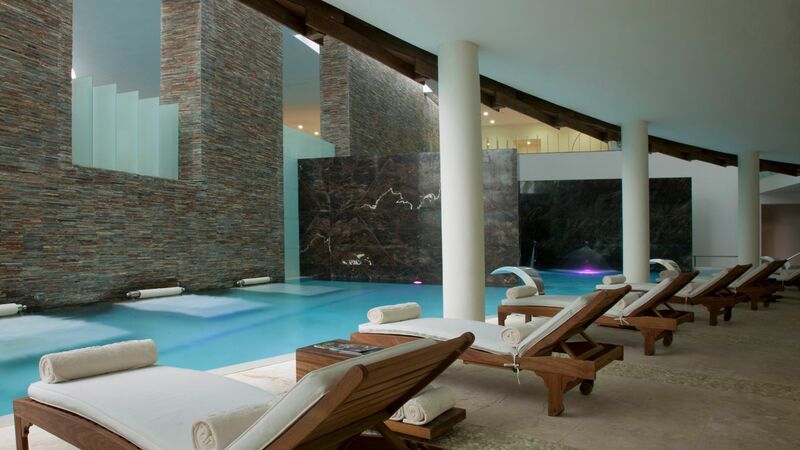 The hydrotherapy experience at the spa is a MUST. We all loved it so much! You leave completely relaxed! Everyone was so friendly and helpful everywhere you go! Would go back in a minute! My wife and I spent 3 nights in Grand Velas. It was our first time in an all inclusive resort and it was above and beyond what we expected. The whole resort was immaculate, the food was wonderful, and the service and hospitality were unparalleled. We stayed in the Zen suite and really love how it was quieter and more secluded. Tona, our concierge was fantastic. We absolutely loved Jose, the pool concierge. He worked so hard and was very helpful. We went snorkeling with Francie, and she was great. We got to see so much! We loved Grand Velas and hope to return again. A highlight of our stay here was the food. We ate a wonderful dinner at Frida with superb service plus we had some of the best room service food we've ever had. We stayed in the Zen section which had a really nice lobby with a very high ceiling. Check in was conveniently conducted at a front couch with some orange label champagne. The service at this hotel was topnotch. They helped us with whatever we needed. If we were to come back here, we would stay in the ambassador section. There were many bugs including mosquitoes in the outdoor hallways to our hotel room. A mosquito got into our room. The shower design was poor. There was no partition between the shower and bathroom floor, so water just flowed out. Also, the bench inside the shower was slanted just so that a big pool of water was not able to drain adequately Other than that, the room size was comfortable, and they provided us with the best complimentary amenities for our anniversary. The beach was not the best because the sand sank by the waves. We would love to stay again though for the food.